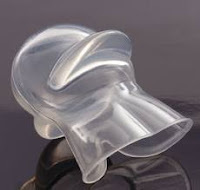 I received in the mail today a new device called aveoTSD anti-snoring aid by Glidewell Laboratories. According to the literature, the way it works is by advancing the tongue forward thereby preventing the tongue from falling backward and vibrating against the throat's back wall causing snoring as well as obstructive sleep apnea. The way the device moves the tongue forward is by literally suctioning the tongue tip into the device and holding it in place by vacuum seal. The theory behind how this device works is sound and mimics what an oral appliance does as well as several surgical procedures including base of tongue reduction, hyoid advancement, and Repose procedure. The one caveat I have with this device is that it only resolves snoring due to the tongue. It would not necessarily address snoring that comes from the nose or palate. There are other devices/surgeries that would address those areas (breath-rite strips, Pillar procedure, UPPP, septoplasty, etc). Read more about the aveoTSD here. Read more about snoring here.